Hope you are having happy weekend. Today am going to share a quick easy DIY Coffee scrub recipe that works for all skin types. Scrubbing is mandatory for everyone irrespective of their skin types. If you don’t exfoliate your skin for a longer time, your skin becomes dull and lifeless. So it is important to include scrub in your skin care regimen. There are many scrubs out there for all skin types but I prefer DIY scrub over the store bought one since most of our skin is sensitive to the store bought scrubs, mainly if you have acne prone skin in fact it will aggravate the acne problem. 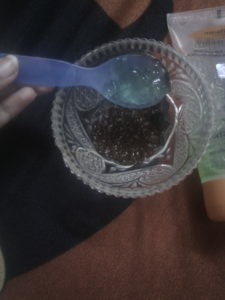 So I recommend you to use DIY scrub that suits your skin types. The ingredients used in this scrub are all natural and it will suit most of the skin types. My skin type – Sensitive, oily, acne prone skin. 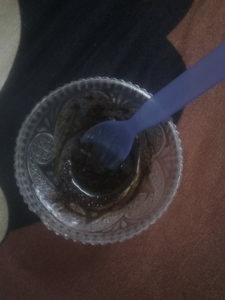 Take a clean bowl and add 1 spoon of coffee powder to it. I have added organic coffee powder buy you can use any coffee powder of your choice. Now add ½ spoon of sugar to it and mix well. Add 1 spoon of Aloe Vera gel to it, I have used patanjali aloe vera gel but you can use aloe vera gel that suits your skin type .You can also use fresh aloe vera gel from plant. Mix it well. I f you feel that the consistency is too thin to scrub, then you can add a pinch of rice flour to it. 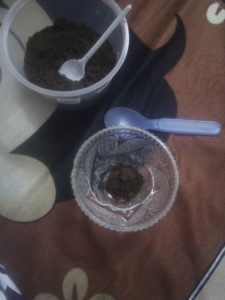 Tadaa our coffee scrub is ready to use. Wash your face and steam your face (steaming is optional) and apply this scrub all over face and neck. Now scrub your face in circular motion until sugar is completely melted. Be very gentle while scrubbing. Then leave it for about 5 minutes and then wash your face with running water. Follow it with your face mask. Do this twice a week and you will notice huge difference in your skin’s texture within 3 to 4 weeks. Coffee is rich in anti-oxidants and it prevents ageing of skin. It is a mild exfoliator and Its aroma soothes our mind and relaxes us. 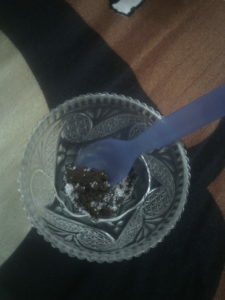 This coffee scrub with coffee in it With regular usage removes dark spots and minor scar from our skin. You have to use coffee regularly for atleast 2 months in your skin care regimen if you want to remove pigmentation and old scars. Coffee is widely used in eye serums to remove dark circles. I love using sugar in my DIY recipes since it brings healthy glow to one’s face when used topically. Consumption of sugar damages your skin whereas topical application is good for our skin. It scrubs our skin gently without drying our skin. Try to use sugar in your DIY products, to have glowing skin without a highlighter. 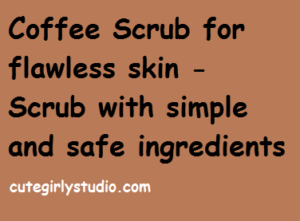 It soothes our skin while coffee and sugar is scrubbing our skin. It also gives a smooth base for our scrub to exfoliate gently. If you are allergic to Aloe Vera you can use milk in the place of aloe Vera since it also soothes your skin and prevents dryness. Aloe Vera has vitamin E which helps to regenerate the cells. The benefits of Aloe Vera are numerous. Do a patch test below you ear to test whether the ingredients suit you or not. If you don’t have any allergic reactions then you can continue using it all over face and neck. Use this scrub twice a week for atleast 2 weeks to see notable differences in your skin’s texture. Always prepare fresh batch and use it. Don’t prepare big batch and store it in fridge for later use. Try this scrub and share your feedback in the comments section below. Your comments mean a lot to me.